Discourses in the disability movement and disability research are predominantly focussed on adults. This volume, ironically, is further evidence of this bias. 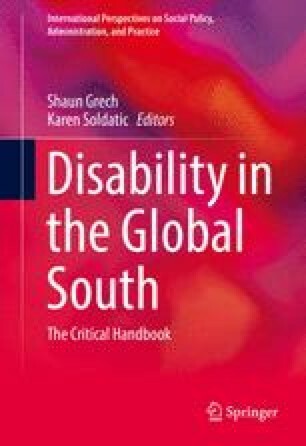 In this chapter we set out to illustrate why the lives of disabled children and young people and their families, especially those living in low-income settings globally, warrant more attention. We argue that their perspectives can and should be more actively sought. We draw on theory from childhood studies and disability studies, both of which maintain a bias towards consideration of those in the global North. We also draw on participatory research and project work, first with disabled children themselves in South Asia and Uganda, and second with parents in South Africa, to show that there is much to be learned by listening to both groups, encouraging their direct participation in research as well as in programme planning, implementation and evaluation. Save the Children & Handicap International. (2011). Out from the shadows. Sexual violence against children with disabilities. London: Save the Children UK. Retrieved from http://www.savethechildren.org.uk/sites/default/files/docs/out_of_the_shadows_5.pdf. UN. (1989). Convention on the Rights of the Child. Retrieved from www.ohchr.org/english/law/pdf/crc.pdf. UN. (2006). Convention on the Rights of Persons with Disabilities. Retrieved from http://www.un.org/disabilities/default.asp. World Health Organization. (2010). Community-based rehabilitation guidelines. Geneva: WHO. Retrieved from http://www.who.int/disabilities/cbr/guidelines/en/. World Health Organization and UNICEF. (2012). Early childhood development and disability: A discussion paper. Geneva: WHO. Retrieved from http://apps.who.int/iris/bitstream/10665/75355/1/9789241504065_eng.pdf. World Health Organization and World Bank. (2011). World report on disability. Geneva: WHO and World Bank. Retrieved from http://www.who.int/disabilities/world_report/2011/en/.